This tour truly has something for everyone! This wonderful excursion combines panoramic views, Dolphin spotting, the chance to visit a Malt Whisky Distillery and much more. Combine a breathtaking scenic drive through the Black Isle with wildlife hotspots, historic fishing villages and coastal charm for a memorable day tour of the Scottish Highlands. We start our day with a drive along the banks of Loch Ness. Who knows what you might see on the way? The village of Drumnadrochit, close to the banks of Loch Ness, marks our first visit of the day. If time permits you can find out all about this enigmatic loch and its world-famous inhabitant at the intriguing Official Loch Ness Exhibition*. 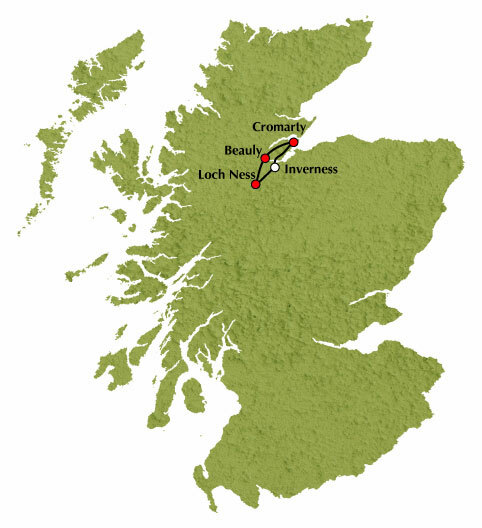 Onwards through Glen Convinth to reach the attractive town of Beauly which is our next destination. Beauly was named by the 13th Century monks who built a priory here, taking the name from the French for ‘beautiful place’ (beau lieu). It’s a short drive to Muir of Ord and the Glen Ord Malt Whisky Distillery*. If you wish, you can go behind the scenes for a distillery tour, which concludes with tasting a dram of whisky #. Next is the expanse of the Cromarty Firth, one of the UK’s largest areas of unspoilt mudflats and an important staging post for migrating waders and wildfowl. The almost landlocked estuary of the Firth was also used as a naval base in both World Wars. We make for historic Cromarty, a sleepy village of quaint fishermen’s cottages, crow-stepped houses and sandstone mansions and, at one time, the main port for the North of Scotland. Careful conservation ensures the village’s historic character has been retained. After a break we continue from Cromarty to Rosemarkie and Fortrose for a stop at Chanonry Point, a popular vantage spot for catching sight of a community of bottlenose dolphins which calls the Moray Firth home. The last part our journey takes us through the beautiful Black Isle then we cross the Moray Firth to return to Inverness. # There will be an extended stop in Beauly when the distillery is closed. Tour Highlights: Loch Ness, Drumnadrochit, Glen Convinth, Beauly, dolphin-spotting at Chanonry Point, Fortrose, Cromarty, pirates’ graves, scenic Cromarty Firth drive and the Kessock Bridge.